SEOUL (Reuters) - North Korea said on Monday it had successfully test-fired a new type of medium- to long-range ballistic missile the previous day, claiming advances in a weapons programme it is pursuing in violation of U.N. resolutions. North Korea fired the missile on a high arc into the sea early on Sunday, the first probe of U.S. President Donald Trump's vow to get tough on an isolated regime that tested nuclear devices and ballistic missiles last year at an unprecedented rate. 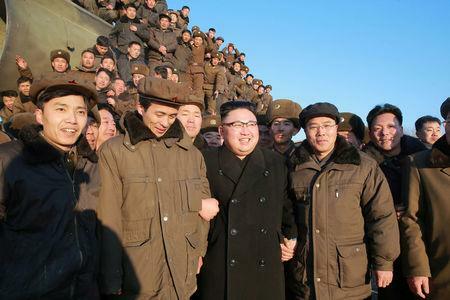 The North's state-run KCNA news agency said leader Kim Jong Un supervised the test of the Pukguksong-2, a new type of strategic weapon capable of carrying a nuclear warhead. The United States, Japan and South Korea requested urgent U.N. Security Council consultations on the test, with a meeting expected later on Monday, an official in the U.S. mission to the United Nations said. Japan said further sanctions against North Korea could be discussed at the United Nations, and called on China to take a "constructive" role in responding. China is North Korea's main ally and trading partner but is irritated by its repeated aggressive actions, although it rejects suggestions from the United States and others that it could be doing more to rein in its neighbour. "We have asked China via various levels to take constructive actions as a permanent member of the U.N. Security Council and we will continue to work on it," said Japan's Chief Cabinet Secretary Yoshihide Suga. China said it opposed North Korean missile tests that run contrary to U.N. resolutions. "All sides should exercise restraint and jointly maintain regional peace and security," Chinese Foreign Ministry spokesman Geng Shuang told a regular briefing, adding that China would participate in talks at the United Nations on the launch with a "responsible and constructive attitude". Russia's foreign ministry expressed concern over the launch, RIA news agency quoted the ministry as saying. North Korea has conducted five nuclear tests, including two last year, although its claims to be able to miniaturise a nuclear weapon to be mounted on a missile have never been verified independently. Leader Kim said in his New Year speech the North was close to test-launching an intercontinental ballistic missile (ICBM) and state media have said such a launch could come at any time. A fully developed ICBM could threaten the continental United States, which is about 9,000 km (5,500 miles) from North Korea. The KCNA news agency said the missile fired on Sunday was launched at a high angle in consideration of the safety of neighbouring countries. 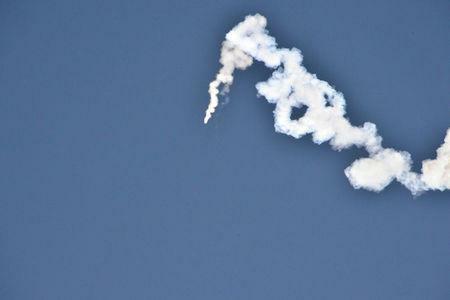 A South Korean military source said on Sunday it reached an altitude of 550 km (340 miles). It flew about 500 km towards Japan, landing off the east coast of the Korean peninsula. The missile was propelled by a solid fuel engine and was an upgraded, extended-range version of its submarine-launched ballistic missile that was tested successfully last August, according to KCNA. The missile's name - Pukguksong-2 - translates as north star or Polaris, the same name of the first U.S. submarine-launched missile. South Korea's military said the missile had been launched using a "cold-eject" system, whereby it is initially lifted by compressed gas before flying under the power of its rocket, a system used for submarine-launched missiles. North Korea's pursuit of large solid-fuelled missiles was "a very concerning development", said Jonathan McDowell of the Harvard Smithsonian Center for Astrophysics. "Large solid-fuel motors are difficult to make work correctly so this is indeed a significant advance by North Korea," McDowell said. In addition to launching more quickly, solid-fuel engines also boost the power and range of ballistic rockets. "Solid-motor engines mean that the fuel is pre-stored and the missile can be launched quickly. For example, rolled out of a cave, tunnel, or bridge," said Melissa Hanham, a senior research associate at the U.S.-based Middlebury Institute of International Studies at Monterey, California. "They are also more difficult to track by satellite because they have fewer support vehicles in their entourage." The North's Rodong Sinmun newspaper showed pictures of a missile fired from a mobile launch vehicle, with a flame appearing only after it had risen clear of the vehicle. 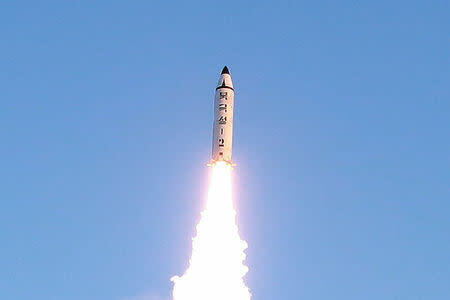 Before Sunday, the North's two most recent missile tests were in October. Both were of intermediate-range Musudan missiles and both failed, according to U.S. and South Korean officials. A U.S. official said at the weekend the Trump administration had been expecting a North Korean "provocation" soon after taking office. The latest test came a day after Trump held a summit meeting with Japanese Prime Minister Shinzo Abe, and also followed a phone call last week between trump and Chinese President Xi Jinping. Abe described the test as "absolutely intolerable". In brief comments made while standing beside Abe in Florida, Trump said: "I just want everybody to understand, and fully know, that the United States of America is behind Japan, our great ally, 100 percent." Trump and his aides are likely to weigh a series of responses, including new U.S. sanctions to tighten financial controls, an increase in naval and air assets in and around the Korean peninsula, and accelerated installation of new missile defence systems in South Korea, the administration official said. However, the official said that, given that the missile was believed not to have been an ICBM, and the North had not carried out a new nuclear explosion, any response would seek to avoid increasing tension.